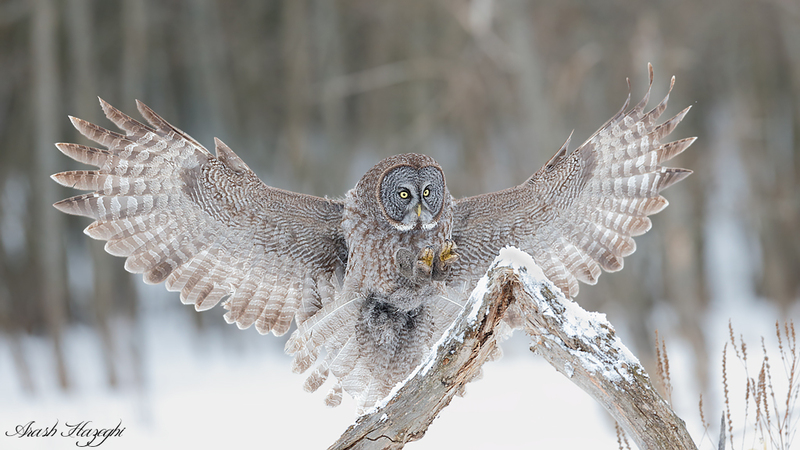 Back in February, I came across an opportunity to photograph great gray owls in Ottawa, ON. I had the pleasure of shooting with great photographer and fellow BPN avian mod, Daniel Cadieux. 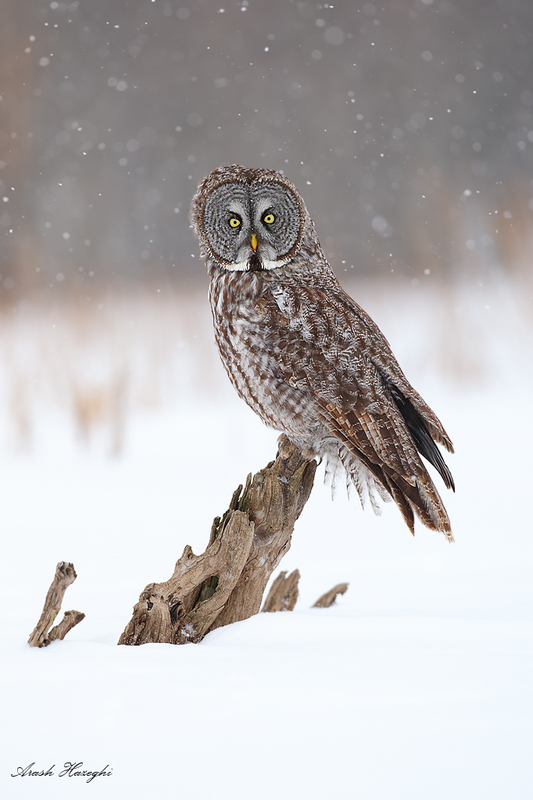 Dan resides in Ottawa area and is an expert in finding the owls at locations that are favorable for photography. I spent three days shooting with Dan and enjoying his company. The great grays are used to people and quite approachable at this location, but you still need to know what to look for and where to look at. Nature has given this spectacular raptors predatory advantage by arming them with a perfect camouflage. It took me a while before I was able to spot an owl that was sitting only a few tens of yards away on top of a branch. It is amazing how well they can blend in with the environment. Great Grey owls plumage perfectly matches the surroundings. EOS 1DX, EF 300mm f/2.8 IS II, f/4 1/2500sec ISO 1250. The great grays have a dominant presence, the intense look and the large facial disk is quite captivating. In addition to their powerful vision, their hearing is also unmatched. According to the experts, they can spot prey as deep as two feet under the snow. This short clip from National Geographic explains how their facial disk is actually a dish antenna! 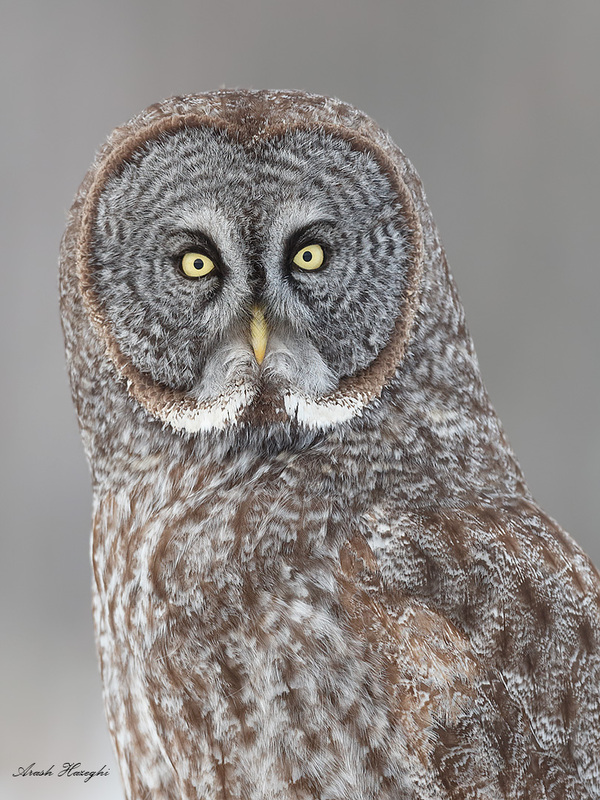 Great gray owl portrait. EOS 1DX EF 300mm f/2.8 II f/4 1/2000sec ISO1000. For this trip, I decided to use EF 300mm f/2.8 II, which is an incredibly light and compact lens. Since the owls would tolerate our proximity the short focal length was not an issue, however I still prefer to use my EF 600mm f/4 II as the shallow DOF and creamy bokeh allows me to completely isolate my subject from the background. With a short lens, it is difficult to isolate the subject from the background so I mostly concentrated on close distant shots as well as those that depict the habitat. Beware some flights to Canada use the smaller CRJ (Canada Regional Jet) aircraft. The overhead bins in this type of aircraft is very small and cannot fit the popular ThinkTank airport security or airport security international roller bags. Fortunately the 300 fitted in a standard backpack. 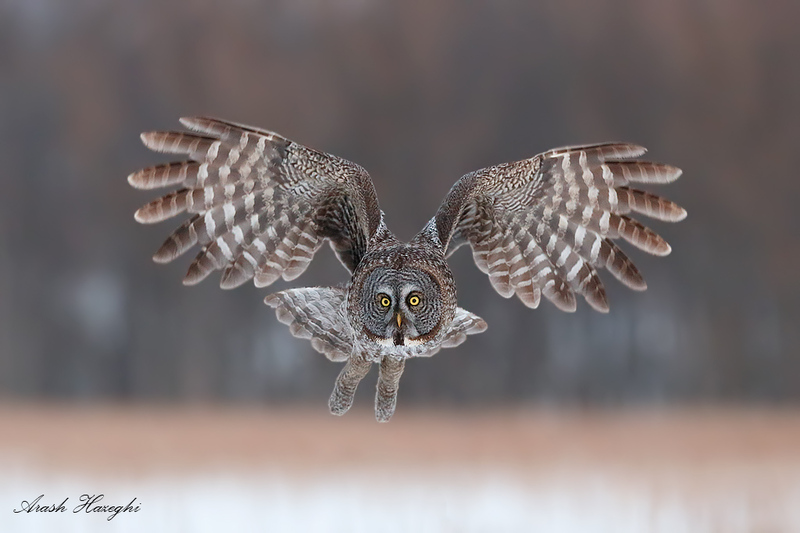 Landing great gray owl, EOS 1DX EF 300mm f/2.8 II f/4 1/2000sec ISO 1000. Those talons are very sharp! Click here to see a full HD file. 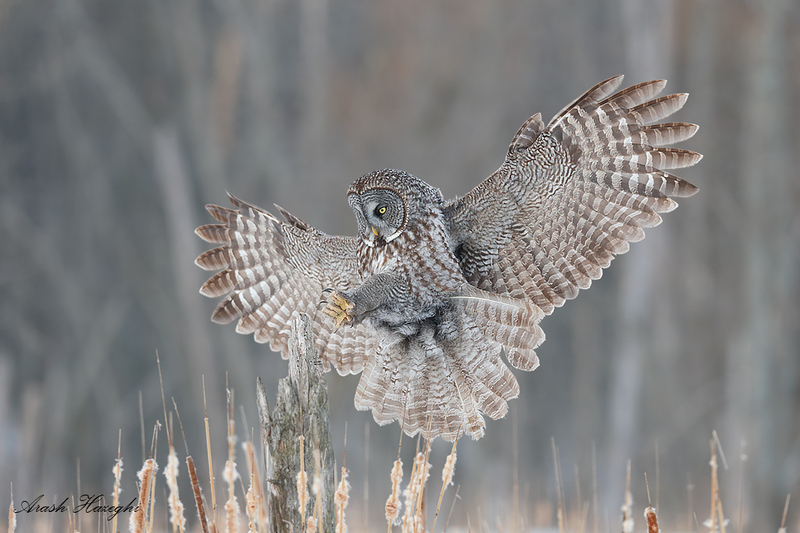 Great gray owl with full downstroke. The cattails are a part of owls habitat, they add a touch of color to the rather dull snow and frozen tree background. Conditions were overcast which is great for owls as it hints to the cold environment these owls normally live in. I had to use high ISO most of the time, fortunately the 1DX does not break a sweat shooting at ISOs as high as 6400. I had previously made photos with both EOS 1D Mark IV and EOS 5D Mark III at ISOs above 3200 but the output wasn’t really great for anything beyond a web presentation. Many cameras can produce high ISO files that look OK for small web presentations but files fall apart at when making large prints or when making a full HD-size output for display on large screens. With the EOS 1DX the level of detail even at these ISOs is unprecedented, I made a giant print of the image above which was cropped a bit too, and the print speaks for itself. What I like about EOS 1DX CR2 files at high ISO is that the color tonality is preserved while details remain sharp. With minimal amount of noise reduction, grain is removed delivering a sharp detailed output. 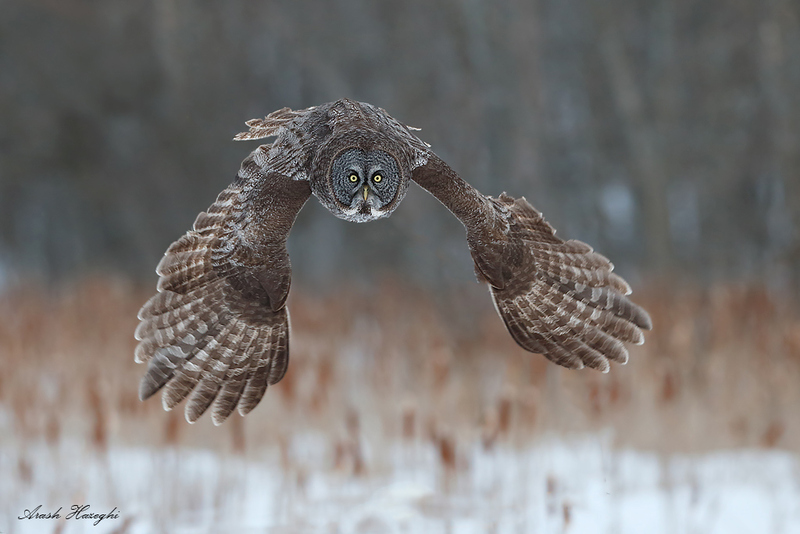 Incoming great gray owl. The owls fly very low, maneuvering just above the cattails. EOS 1DX EF 300mm f/2.8 II f/4 1/1600sec ISO 5000. The low light AF performance of the new flagship body is excellent delivering tack sharp RAW files frame after frame in most challenging conditions with the bird coming directly at the photographer. Owls have a flat facial disk, so focus precision is very important, if it falls it bit behind the face will not look sharp. I really liked the EOS 1DX performance here. 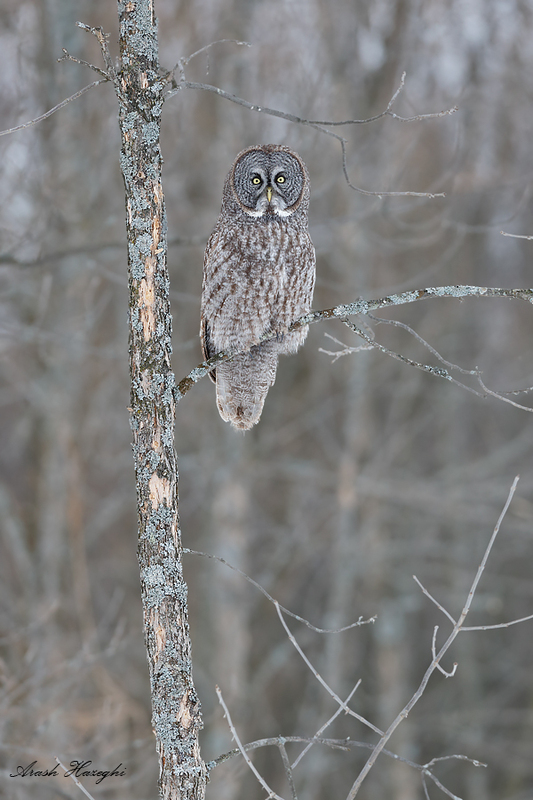 Great gray owl after sunset. The last light created a pinkish sky and subtle warm tones adding to the ambience. Usually, these subtle tones are very difficult to preserve at such high ISO . The EOS 1DX did an excellent job. EOS 1DX EF 300mm f/2.8 II f/4 1/1600sec ISO 6400. RAW processed with Canon DPP 3.12. Please see my guide for processing details. Fortunately we had a morning with snowfall which created some unique opportunities for making photos with the falling snow in the background. Owls really stand out against the snow and the dark background. 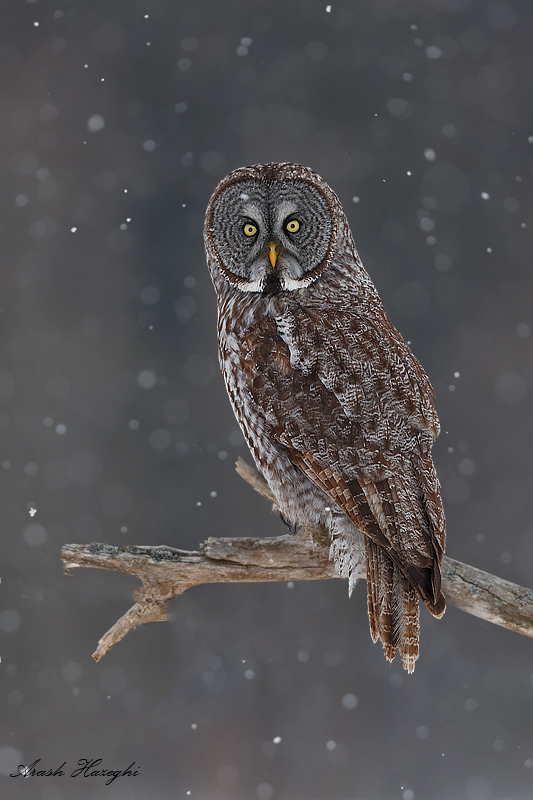 Great gray owl in falling snow. EOS 1DX, EF 300mm f/2.8 II, f/4 1/2000sec ISO 1250. I used fast shutter speed to freeze the snow flakes. 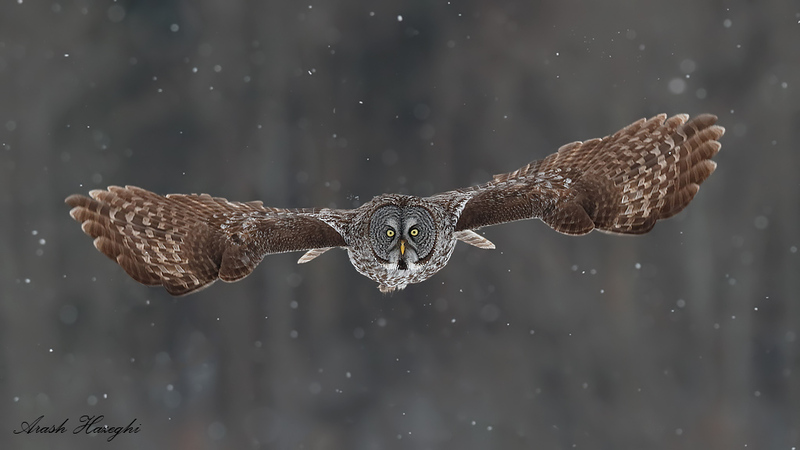 Of course flight in snow can make very dynamic scenes, this is a very tough situation for the camera’s AF to maintain critical focus on the owl in falling snow and poor weather. The EOS 1DX did very well, enabling me to capture dynamic flight poses. 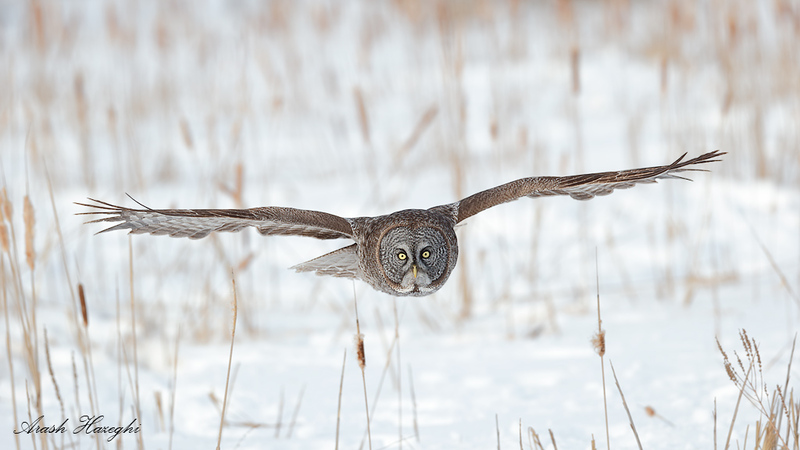 Great gray owl incoming in snow. EOS 1DX, EF 300mm f/2.8 II, f/4 1/2000sec ISO 1250. The owls look great against a plain snow background as well. The contrast between the pure white snow and gray plumage looks very attractive, especially in a large print. 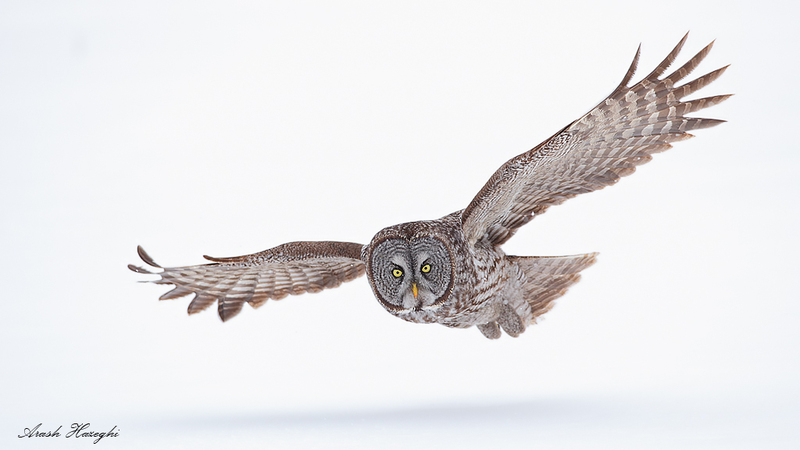 Great gray owl in the studio! The diffused shadow of the owl on the snow gives a sense of depth. EOS 1DX EF 300mm f/2.8 IS II f/4 1/2000sec ISO 800. I liked this particular frame, it gives the impression that the owl is on an isolated island. Great gray owl on an island. EOS 1DX EF 300mm f/2.8 IS II, 1/2000sec f/4 ISO 800. The key to get the exposure right for these images is using manual exposure. Camera’s meter will be fooled by the snow producing a dark (underexposed image). I exposed for the owl but without pushing the exposure too much. Fortunately, the high dynamic range sensor in the 1DX has enough headroom to render the subtle texture in the snow (best visible in the prints that I made) while the darker plumage remains sharp and clean after adjusting shadows in RAW. The best background in this location was of course the cattails. The owls fly very low, literally just above the cattails. This creates pleasing images that also have an element of environment and habitat. At the same time these images are a bit more challenging for the AF as it may lock on the cattails. The 1DX provides a tight expansion pattern that is ideal for this situation. AF holds nicely even when the sensor accidentally slips off the bird (AI-servo tracking sensitivity set to slow). 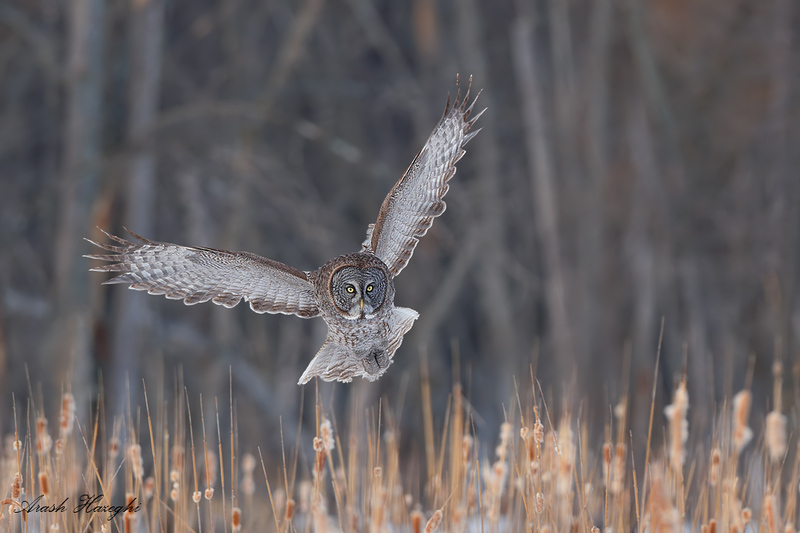 Great gray owl flying low on cattails. Center AF sensor with four expansion points places on the facial disk. EOS 1DX, EF 300mm f/2.8 IS II f/4 1/2500sec ISO 400. 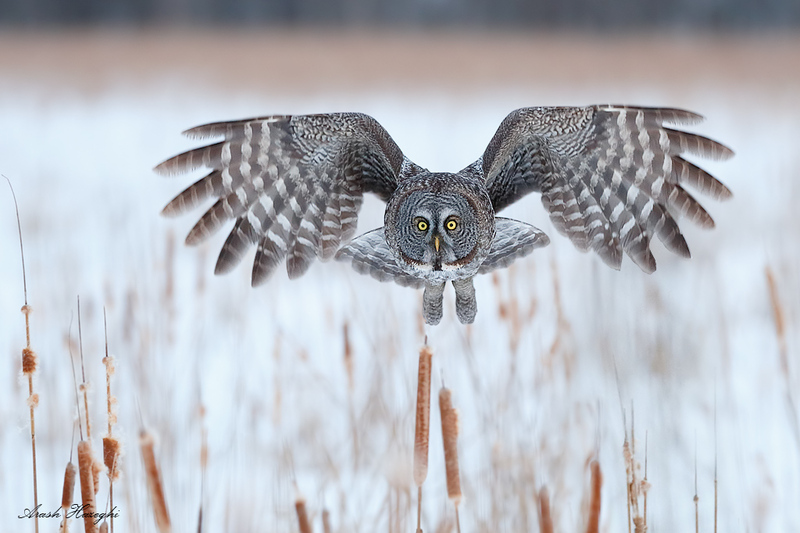 The owls have perfect eye sight to spot the prey from above the dense cattails. low altitude cruise. Owl scanning cattails for prey. EOS 1DX EF 300mm f/2.8 IS II, f/4 1/2000sec ISO 800. The landing frames are quite interesting too, owls land with extreme control and precision despite their immense size. They sometimes land on perches that seem too small but they can manage. Landing owl, EOS 1DX, EF 300mm f/2.8 IS II f/4 1/2000sec ISO 1600. 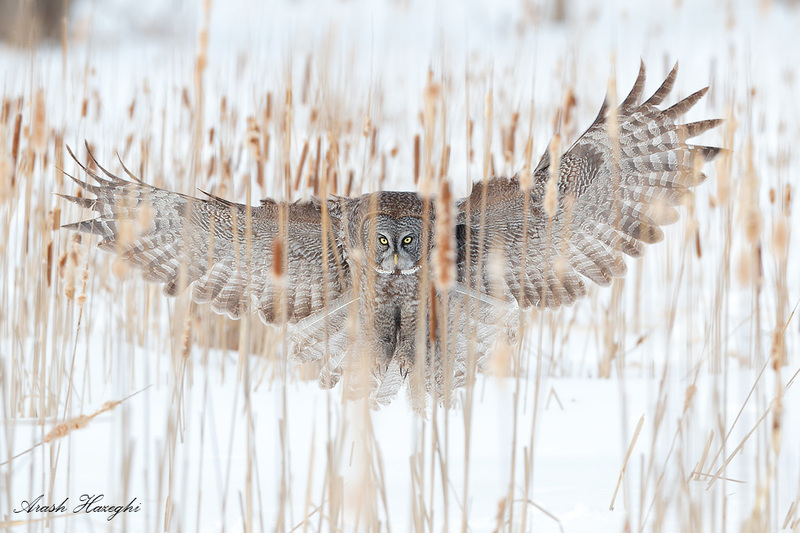 One of my favorites of the trip was the image below, the owl behind the cattails. I used single AF sensor to maintain focus on the owl, click here to see how I was able to quickly change AF expansion mode. From behind the cattails. 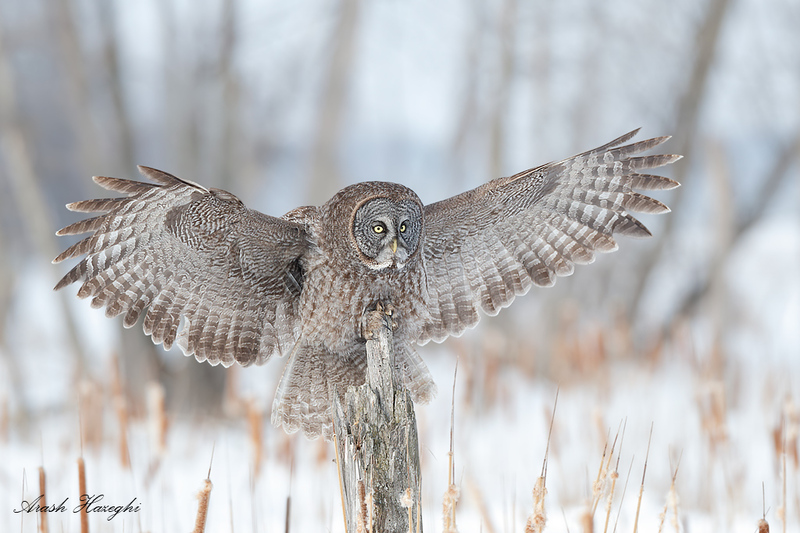 Great gray owl, EOS 1DX EF 300 f/2.8 IS II f/4 1/2500sec ISO 500. 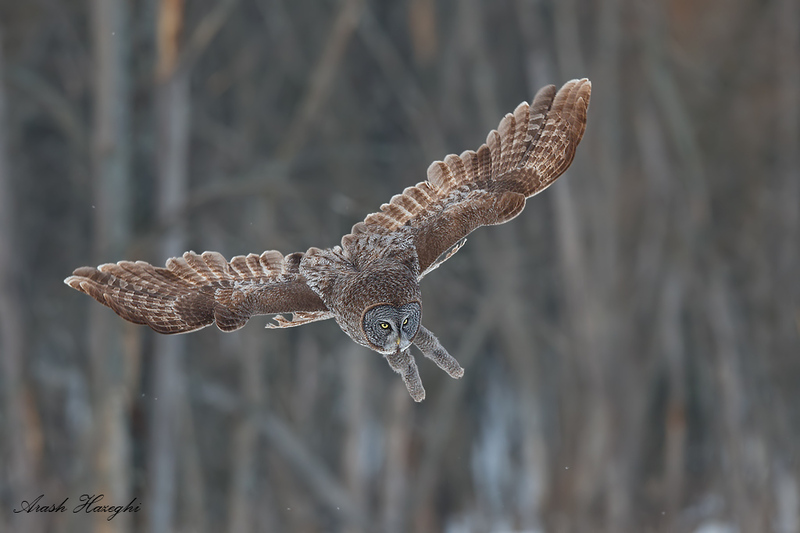 Great gray owl breaking for a dive. EOS 1DX, EF 300mm f/2.8 IS II, f/4 1/2000sec ISO 800. I hope you enjoyed this short blog. Please visit my great gray online exhibit for more images. Many thanks to Daniel for making it possible to capture these images. Arash, you take amazing photos ! What awesome shots!! An amazing camera in the hands of someone who really knows what he is doing — a joy to see. Lovely images and wonderful job- You are the number one take picture of Bird in flight. It is hard to take picture bird in flight. I have to study more. What do you think that you can encourgae to do in order to get it. I am an amateur photographer just learning little by little on my own. I also have a passion for owls, they are gorgeous creatures. Looking for tattoo ideas and ran across the photography aspect of your page… Simply breathtaking! Amazing photos Ari! I recently purchased a Tamron 150-600mm lens and have been eager to capture one of these owls. I have heard that a great spot to see a number of owls is Amherst Island south of Kingston ON, have you heard of this place? 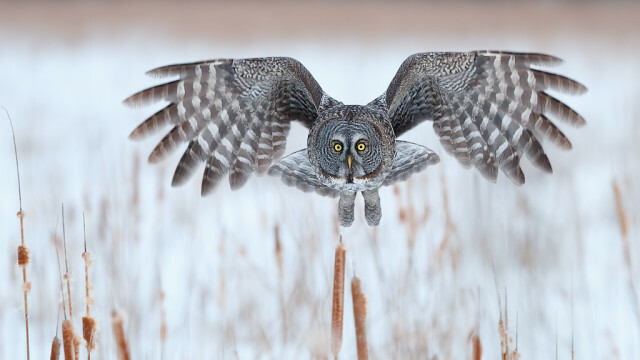 Your photographs of great grey owls are amazing. Astonishing! Brilliant! Everyone above has said it! I am spellbound. Just discovered your work. What a high it is. Every time you think “this one is the greatest”, you discover another that sends you to the moon. Thanks! And ever thanks! !